Has Samsung's Ativ Q Android/Windows 8 hybrid been KO'd by patent woes? The first Android and Windows 8 packing tablet/laptop hybird device, the Samsung Ativ Q may never see the light of day due to patent issues, reports on Tuesday claimed. Android Community brings word that the sliding device, which gives users the option of switching seamlessly between the two operating systems, may be halted by legal issues arising from that very USP. The key functionality, which is thought to feature one virtual OS running within the other, may have caused difficult to resolve and perhaps unresolvable problems for Samsung, despite its best efforts. The convertible device, launched at a Samsung event in London earlier this summer, also promised to deliver the highest resolution screen ever seen on a tablet with its 3200 × 1800, 13.3-inch display. Like Samsung's popular Note series, the Ativ Q was scheduled to arrive with the company's patented S Pen, along with a multitude of ports, up to 128GB of storage through microSD and 4GB of RAM. 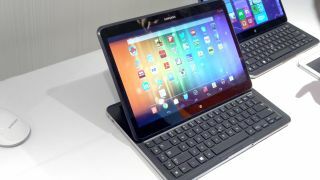 In an early hands-on review TechRadar wrote: "We can see this becoming a part of daily life without much of an issue, and while the weight is a lot more than you'd expect for an Android tablet, if you're considering a laptop replacement this should be a real part of your consideration. "We're still waiting to hear price, which will make all the difference, but should this sit somewhere palatable Samsung will have a real winner on its hands." If reports this week are to be believed, users may not have the opportunity to capitalise on the device's interesting and unique promise. TechRadar will update this story if there's anything official to add. Are you ready for the Samsung Galaxy Gear smartwatch? Speculation suggest we're just a week away from an official unveiling.